I've reviewed the 1st issue of "Dash" and have also reviewed the 2nd issue as part of a larger segment. One reason I've given the amount of attention to the comic that I have is I find the subject matter fascinating--a private detective in 1940's Los Angeles deals with the fact he is hated for being openly gay (not that he necessarily intended to come out, he was as successful cop before being revealed as a, "Homo," and kicked-off the force), and works his hardest to solve mysteries no matter who gets in his way. The end of the 2nd issue hinted at some fantastical elements coming more into play and sure enough they have as of this 3rd entry in the series. 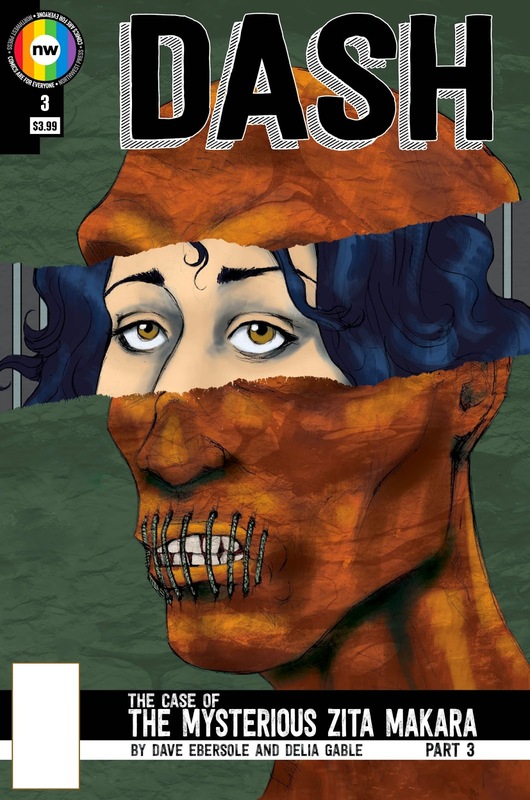 Published by Northwest Press, "Dash" has protagonist Dash Malone in this 3rd issue continuing to deal with the fact a man he loved (called "Plink" by his friends) has been murdered, and that it all seems to tie into a strange conspiracy involving a mysterious mummy. At the end of the 2nd issue Dash was being assaulted by a woman named Zita who had attempted to hire him for a case, and this issue opens with Dash describing what happened to his only friend left on the police force, Sal, and his secretary, Cindy. We continue with an expertly-illustrated fight scene between Dash and the dangerous--and suddenly quite strong--Zita. Artist Delia Gable provides some stellar and animated panels as Dash and Zita brawl, with the aftermath of Dash thinking he nearly died (or even did die and somehow came back) resulting in some serious trauma for our hero. As we reach the end of the comic we see Dash confronting Zita down at the police station (where she has been detained) and learning that something evil is definitely lurking in Los Angeles, and it is responsible for Plink's death. When I first started reading "Dash" I did not know it would take a turn for the supernatural. I don't mind it doing so however, because Dash Malone is such a fascinating and easy-to-like guy that I would gladly read a story where he tackles any kind of case--normal, supernatural, etc. I greatly enjoyed this third issue but it suffers from a problem that many mini-series do in that with us being in the middle of the story a lot of things have to be set-up to pay off later-on. Therefore right as Zita is about to tell us some answers the issue ends. It results in me wanting just a bit more to keep me satisfied until stuff really gets crazy in the next issue, but I suppose I'll just have to wait patiently. "Dash" has been a highly enjoyable comic so far, with much thanks going to writer Dave Ebersole for giving us such a great protagonist, and just as much appreciation being due to Delia Gable for her superb artwork. Should your comic store not have a copy of the 3rd issue of "Dash" you can buy it here, and I would recommend you do just that. Now I just have to try and stay calm while I wait for some answers in the next issue!